Aries Mythology, the ram that was golden. Aries, the Ram, is the first of the zodiac constellations. In Grecian Aries Mythology, Aries symbolizes the beast whose wool was sought-after by Jason and the Argonauts. Babylonia, Egypt, Persia, Greece, and Rome, all these cultures regarded Aries as a ram. In the Hellenic Republic, Aries was most linked to Jason and the Argonauts, the story of the quest for the Golden Fleece. The King of Croneus, named Athamas and wife number one, named Nephele (whose name stood for "Cloud"), had two kids: a boy named Phrixus and a girl named Helle. King Athamas grew bored and sick of Nephele, King Athamas sent Nephele away and hooked up with Ino, daughter of Cadmus, the King of Thebes. King Athamus took a second wife, Ino, she was exceedingly envious and of acrimonious when it came to the King's children, Phrixus and Helle, particularly the boy, Phrixus. Ino had a sneaky plan: to cause the corn crop to go bad. Ino persuaded the women of the land to roast the seeds of corn prior to the men sowing them into the ground. The men were ignorant of this horrible sabotage. Once the undermined crop refused to sprout, not one person guessed that the queen regnant Ino was the mastermind behind the catastrophe, so no one accused her. King Athamas sent messengers to the Oracle at Delphi so he could ascertain what to do in order to pacify the deities and make things right again. The devious Queen Ino prevented this by greasing the palms the courier sent by her the King. Ino told the messenger to tell the King that the oracle said there was to be a ritual killing of the prince Phrixus and the population would evade famine. The King was desperate so, he complied. While King Athamus was sorrowful for the doom to be visited on Phrixus and Helle, he couldn't allow his people to go hungry. The King resolved to abide by what he thought was wise advice from the oracle. The boy's mother, Nephele implored King Athamus to save their son but couldn't convince him. Nephele posted a guardian to keep an eye on Phrixus and Helle. This guardian wasn't human, but a ram whose wool was golden. The ram had been a present to Nephele from Hermes and the creature was completely devoted to queen Nephele and her children Phrixus and Helle. When the date of sacrifice came, the ram found Phrixus and Helle. The ram told them to leave the kingdom right away. The ram ordered them to mount its back, and they did. The ram told Phrixus and Helle to hang on tight. Regrettably, when the ram passed over the of body of water between Europe and Asia, Helle dropped to her demise (the place she fell is still called Hellespont or Dardanelles), but Phrixus her brother, made it to his refuge on the shore of Colchis that stood at the east end of the Black Sea. This is where King Aeetes (son of Helius and brother of Circe) welcomed Phrixus with benevolence and gave Phrixus Chalciope, his oldest daughter to marry. Because he was so thankful, Phrixus killed the golden ram to honor Zeus Phyxius (Zeus as the god of flight). Phrixus presented the gilded fleece to King Aeetes. The king had the wool placed in hallowed brushwood, defended by a horrendous flying lizard that never slumbered. Phrixus and Chalciope had four sons Argus, Melas, Phrontis and Cytisorus, they would take on a minor role in the legend of the Golden fleece. 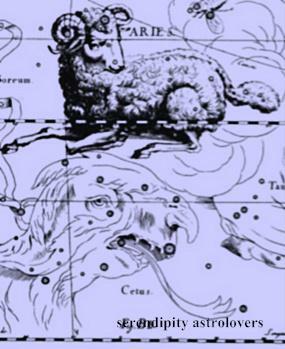 But, in this Aries Mythology story;Zeus placed the ram's likeness in the heavens to immortalize the ram for its courage as the constellation Aries, and there it glistens to this very day. When Jason challenged Pelias, the hypocrite told Jason he would give him the throne if he brought him the Golden Fleece. Jason constructed a ship called the Argo, and sailed it with his crew called the Argonauts, some of the greatest heroes of Greece. Even Hercules sailed on the Argo. With the Argonauts help, Jason succeeded in gaining the golden fleece. Pelias thought the Argo had sunk. When Jason returned, Pelias still refused to give up his throne. Hera hoped Medea would kill Pelias. Medea tricked Pelias daughters into killing Pelias. Medea told the girls that she could turn an older ram into a young ram by cutting it up and stewing it. While boiling the old ram, a fresh youthful ram jumped, out of the pot. All worked up, Pelias' girls hacked their father into bits and cast him in a pot. Pelias didn't make it. In Aries Mythology, Aries comes from the Latin (Aries the Ram), translated to Greek (Krios the Ram), translated to Akkadian (Immeru the Sheep). Want a Aries astrology sign to be attracted to you?